We are honored to invite the community to come and be a part of this amazing celebration! Join us for a full weekend of Capoeira, Dance, and Music from Friday, June 21 - Sunday June 23, 2019! This year we are proud to welcome the best dance Masters in the nation to share their knowledge with the community! Urubu, Batata, Jamaika, Sabara, Roque, Galego, Canguru, Borracha, Mumia, Elias, Parafina, Palmares, Paulo Batuta, Papalegua, Penteado, and more to be announced. Joining us straight from Brazil, Mestre Tonho Materia. Tigreza, Xingo, Chin, and more. Corpo Fechado, Saracuru, Massape, and more to be announced. Featuring: Special guest teachers and Mestres. 11:00 AM - Pre-Carnaval Warm-Up at State St. & Cota St.
12:00 PM - Carnaval Parade Begins & Capoeira Rodas - State St. & Cota St. Featuring: Super Sonic Samba School, Brazilian Dance Company, Sambamerica Dance Collective, Dancers, Live Brazilian Band, Batucada Ensemble, Capoeira Performances/Rodas, and much more. 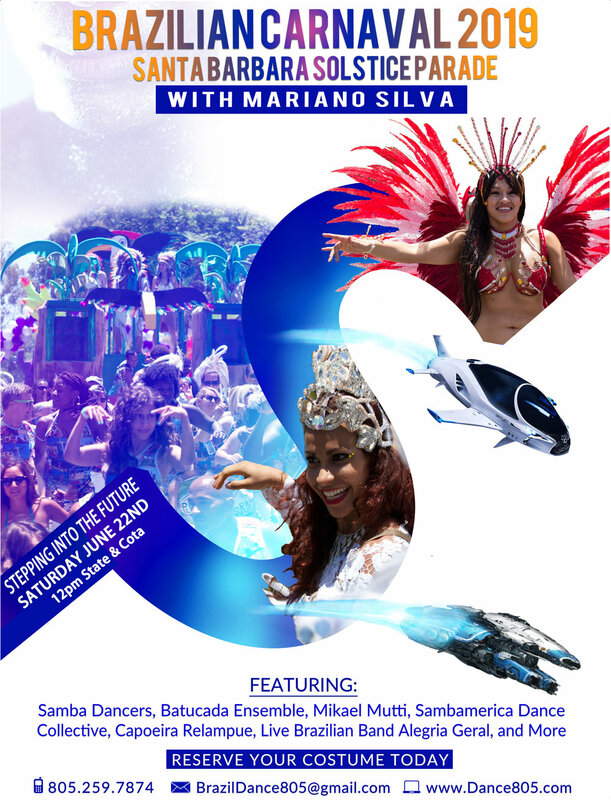 Featuring: Brazilian DJ, Batucada Ensemble, Samba Dancers/Performances, Capoeira Performance, Brazilian Cuisine, Tropical Brazilian Drinks, Brazilian Bikini Fashion Show and more! Mariano Silva @ (805) 259-7874. This package includes all workshops and roda on Friday evening, full Saturday package featuring the Carnaval T-Shirt, Entry to the Brazilian After Solstice Celebration Party where all ages are welcome and the Sunday workshops featuring multiple master classes and rodas with world renowned instructors and more! This package includes the full Saturday and Sunday festivities featuring the Carnaval T-Shirt, Entry to the Brazilian After Solstice Celebration Party where all ages are welcome and the Sunday workshops featuring multiple master classes and rodas with world renowned instructors and more! This package includes the registration for the dynamic master classes that will be lead by world renowned instructors of dance and Capoeira. These workshops are designed to engage all members of our community no matter what level of experience an individual may have. We take great pride in the quality of instructors that we invite to teach to our community members. This package includes the full Saturday Carnaval Celebration featuring the Carnaval T-Shirt, and Entry to the Brazilian After Solstice Celebration Party where all ages are welcome.